Panem is a future post-apocalyptic North America, made up of a Capitol that rules over twelve Districts. To punish the districts for rebelling against them 74 years ago - an uprising in which, as the Capitol always reminds them, District 13 was wiped off the map - every year each district must send two child Tributes, one boy and one girl, to compete in the Hunger Games. Forced to survive whatever the Capitol throws at them, fighting and killing each other, only one will be crowned the champion. For Katniss Everdeen life in the poor coal-mining District 12 has been a struggle ever since her father died in a mining accident. She has struggled to support a mother lost in grief and a younger sister. She and her friend Gale illegally hunt in the woods beyond the electric fence surrounding their District, risking execution to feed their families. Every year when the Reaping comes around, Katniss fears that her name will be pulled from the container; she has never worried that it will be her sister's. To save her sister, Katniss volunteers in her place, condemning herself to an almost certain death. Now she is off to the Capitol, where it is not only the other Tributes in the Arena she must battle against, but the politics driving the Hunger Games as well. If the movie had not been made, I probably wouldn't have read this book. But I wanted to see what the hype was about. I am actually surprised that I really enjoyed this book. A lot. I think the main character could have easily fallen into Mary Sue territory, but I found her well written as a sympathetic heroine that I was rooting for. The whole atmosphere of the book, the hopelessness of the people in the Districts, the desperation of the games, is just done so well that it drew me in completely. And there's a part near the end that almost gutted me. I do wish we could have seen some of the other action happening in the book, but I understand why it's only told from Katniss' point of view. 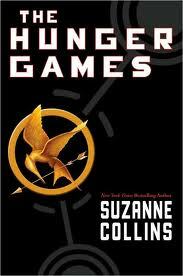 In other books, where I've found it takes away from the book, here it works well because, like Katniss, we don't really know what's going on as she is trying to survive the Games. Like my sister, I had no intentions of reading this book (even when the movie came out) but since she liked it and a few of my friends liked it, I gave it a try and was pleasantly surprised that I enjoyed it. The story was well thought out and was interesting, the plot flowed nicely, the characters were well rounded and developed for the most part and I actually liked the main character. Usually I find main female characters in books geared for a younger audience annoying and I loathe them, but I was actually cheering for Katniss. The one part of the book I found unbearable was the ‘romantic’ subplot between Katniss and Peeta and there was a chunk of the book near the end devoted to it. It had nothing to do with my hatred of romantic subplots in general because I always find them superfluous to the story; this one actually fit with the plot. To me it just felt unbelievable. I have no idea if that was due to the fact that we are made to believe that Katniss is incredibly awkward around people or if the way the author wrote it made it just incredibly awkward. It just came off to me as very forced and didn’t mesh with the rest of the book, style wise. Other than that I have to admit I liked it.